Why do you think this is? Is it to tone down the risque nature of some British shows? Do the producers think Americans won't want to watch characters with foreign accents? Or is it for some other reason? 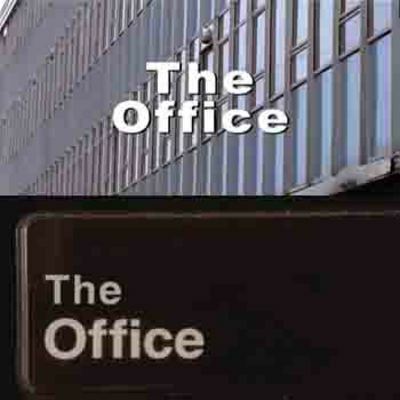 "Two Offices" by Source. Licensed under Fair use via Wikipedia. Mainly the culture differences I expect. Americans probably want to see things that relate to their way of life. Also, when it comes to comedies, the humour can be different, and Americans don't aways get British humour quite the same way. Is there way of life really so different though? I mean, take something like Coupling, it's about a bunch of youngish people getting in and out of relationships and sleeping together. That's like so many American romantic comedies, the only difference being the dialogue is wittier. I have to wonder also why, if they don't think people will get the humour, they buy the show at all. Why not just write something new? The situations are the same, but British/American lifestyles are still different enough for them to feel a bit alienated in some cases. Monopoly was originally an American invented board game, but when it was brought to the UK, we didn't retain all the American streets and stations, but remade it with those of London. I know this is a completely different example, but I think the same idea still applies. Antiques Roadshow - part of the interest in this show is visiting historic locations. America isn't going to be interested in lots of British people's heirlooms being displayed at historical British places; they are going to want antiques collected in America, shown at American places of historical interest. Are You Being Served? - A lot of the slang/phrases/double entendres in this comedy would not be understood by an American audience. They need to swap it for their own. Goggle Box - This is about watching people watching/talking about the latest TV shows on this week. Viewers watch it so they can relate to the people taking part. Americans wouldn't have seen this week's latest British TV episodes, so they need to do their own version, with Americans watching American programmes. Little Britain - Brits taking the mick out of themselves. Why would Americans want to watch that? They want to see Americans making the mick out of themselves. Who Wants to be a Millionaire? - Currency difference, and Americans will want to take part. When I listed shows that were remade I deliberately left out reality shows, quiz shows etc. It makes total sense to me why you would want a local version of a trivia show or something like Antiques Roadshow. It's the fictional shows I focussed on. I understand how Americans might not get the humour of something like Are You Being Served, what I can't understand is why someone would look at something uniquely British and think "let's remake that without the very thing that made it popular." It's odd. Someone even tried to make a remake of Fawlty Towers. I can't see that working with anyone other than John Cleese. Why even try? Bear in mind also that I don't live in Britain myself. We watch plenty of British and American shows in Australia but I can't think of a single fictional tv show from either of those places that has been remade as an Australian show. We just watch them as they are and figure out the cultural context or not. It seems kind of a shame to homogenise everything because you can't be bothered doing that (if that's the reason why, I just don't know). I do agree with you; I was just trying to give a reason to your question. In many cases when they have tried American remakspes, they have failed completely. For xpexample, they tried an American version if Dad's army, but it never made it past the pilot episode. Copycats. Think they'll make $$$$ from it. 'If it was a success in UK, we can make it BIGGER, brighter & better', they think! Apparently, yanks can't understand UK accents, also! Give me the UK version anytime! Superior acting & just down right enjoyable, every time! Look how the yanks mashed-up 'Prime Suspect'! I now Kevin Spacey is a good actor, but, puleese, give me the brilliant Ian Richardson in 'House of Cards'! It seems very odd to me because other you don't see remakes of American fictional shows with British, Australian or Canadia actors. There are lots of British and American shows on here in Australia and people seem to like them and not have any trouble understanding minor cultural differences, so I have no doubt Americans could do the same. Because the writing on British TV is so much better. That would be a reason to watch British shows, not a reason to remake them. Too many remakes full stop, the same with Aussie - The Block and cooking, get some new things on TV and stop trying to ram cooking programs and Renovation programs down our throats. Stop changing the programs without an apology. AND stop running overtime! Gee, I hate that. That's why I don't watch those shoes. Bring back Sunday Night AT 6.30 on channel 7, & 60 Minutes on channel 9 AT 7.30!! I dislike shows starting at 8.45/8.50 etc!